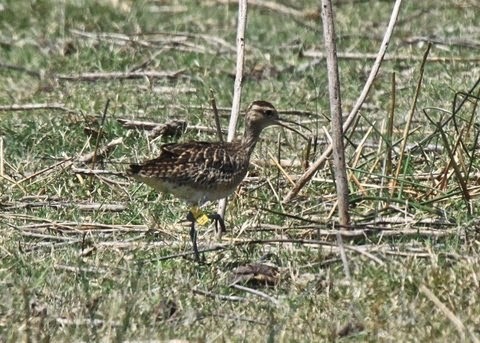 Wader Quest: Little Curlew monitoring project in Northern Australia. 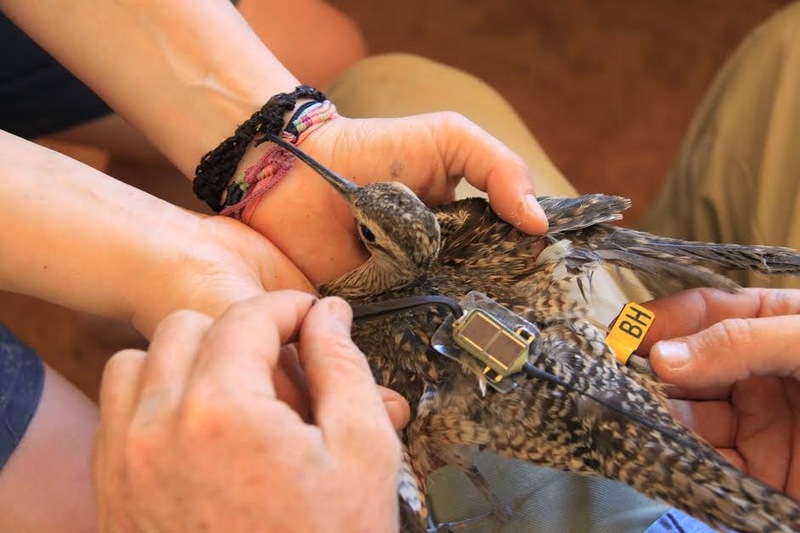 Little Curlew monitoring project in Northern Australia. Our friend Chris Hassell who helped us so much when we visited Broome in Western Australia last year has sent us some information about a Little Curlew tracking project that they are doing over there. When Elis and I visited the Little Curlews had not arrived which meant that it was one of the species we missed on our travels. I have seen one before, back in the good old days when they were called Little Whimbrel, a name which I prefer, when one turned up in Salthouse in Norfolk in August 1985. A satellite transmitter being fitted to one of the Little Curlews last November. The same bird photographed in the field on Roebuck Plains a few days later. The following maps have been prepared by Inka Veltheim for the Australasian Wader Studies Group with which copyright remains. 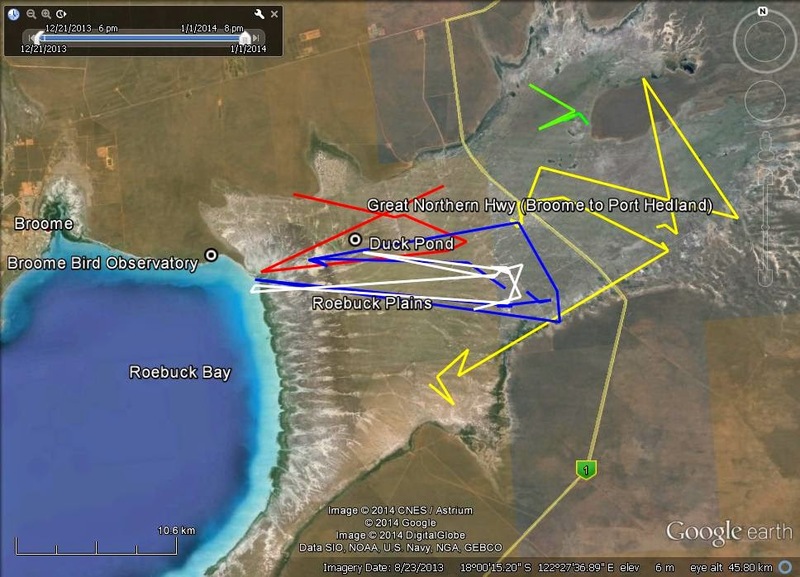 The first map shows the movements of five Little Curlews around Roebuck Plains, each coloured track represents a different bird. The period that they cover was between early November to mid-January. Each track covers approximately a week of movements for a bird. It is interesting how some birds are so much more mobile than others. The second map shows the movements of three Little Curlews which had moved down to the region around the Anna Plains Station (and one to Port Hedland) for the period between late January and mid-March. Although they move over big distances it seems that 80 Mile Beach is a favoured spot for them. One of these Little Curlews carrying a satellite transmitter has now set off on its northward migration. The map below shows its movement directly north from the Broome area. This individual has the leg flag BD and its transmitter has sent back two sets of data up to now. 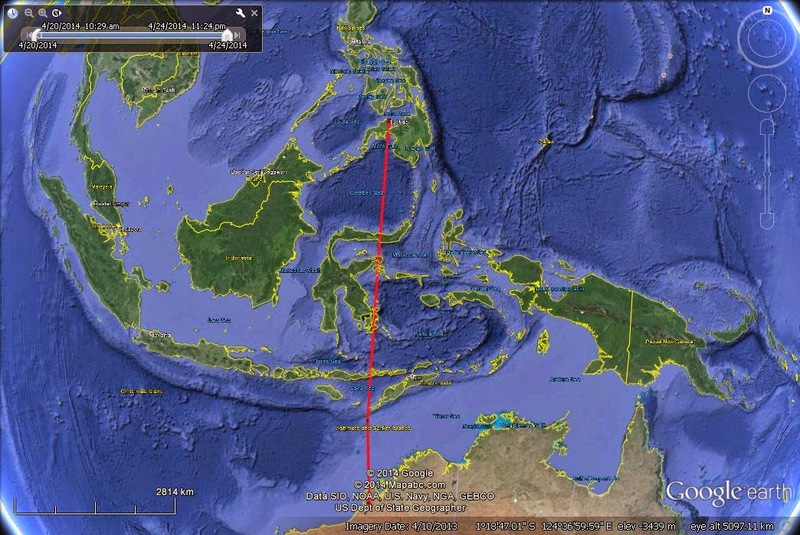 When it sent the first set the bird was in flight close to Indonesia more or less 1,000km north of Broome, the second set showed it to be in the Philippines a further 2,000km north. The team monitoring the bird think that it has stopped there to feed and rest before moving further north as they have received three good transmissions from this location. The other two birds are still at Roebuck Plains, Broome, but will hopefully depart in the next few days. As a celebration of the incredible journeys that waders like the Little Curlew make from Australia to the Arctic and back again, BirdLife Australia is running a nationwide event called Farewell Shorebirds; the event will run from April 10th to May 10th which is, by no coincidence, World Migratory Bird Day. 10 May, concluding on World Migratory Bird Day.